Sundown Farm. It's not much of a farm, as such things go. 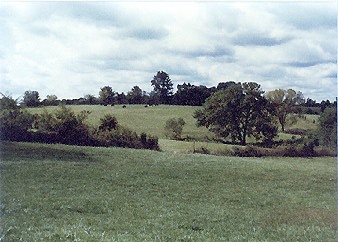 Two hundred and five acres of rolling Kentucky land, classified by the agriculture department as 'severely eroded'. 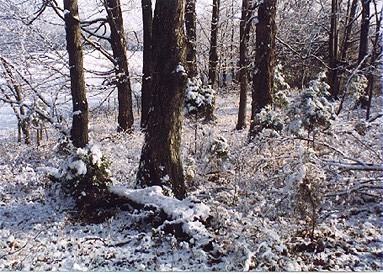 Mostly pasture land, with about 65 acres of wood lots scattered about, the largest a patch of 20 acres, or so. Five ponds, the largest only three-fourths acre, and one stream, which makes the east boundary. Not a farm good for grain, but well suited to animal husbandry, cattle and sheep, and for growing the hay to feed them. When I bought it seventeen years ago, it was the realization of a desire of many years standing. A place to do my hunting, fishing and nature watching things, a place to get away from the bustle of modern life. I can't believe how well it has worked in that regard. The early years were tough, back-breaking work, just getting the place whipped into shape, clearing off all the accumulated junk, repairing and constructing fences and buildings, trying to do a good job of managing a small herd of beef cattle, a small flock of sheep. Not easy work for anyone, but especially for city boys with little knowledge to go on. Well do I remember the first lambs from our flock of ewes, 23 of them born on Christmas day, during a period of three days when the temperature never rose above 12 degrees below zero, and the wind blew 35 mph, day and night. Fifty-five more born during the next week. We saved them all, but I still remember those first three days my son and I spent as one big blur, no sleep, frozen to the bone, the kitchen oven full of limp, frigid lambs, the first we had ever cared for. Hated to see that bunch go to market. From the beginning, as various schemes were tried to make the farm financially viable, I kept in mind the other, more pleasant activities I had plans for. When the fields were mowed, a border was left for the small game. Fence rows were never completely cleared, and little patches of land were left untended, here and there. Very few chemicals were used on the land, opting instead for mechanical and other means to control weeds, and such. Over the years this payed off, and the population of small game grew. It was several years before I could spend much time doing any outdoor things, with all the work that had to be done, in addition to my regular job. Gradually, though, what I had envisioned for the farm came about, and to a degree I could have never imagined. Owning land is a strange, and to me, a special thing. I've come to feel, over the years, the inescapable fact that I'm only a caretaker of the land for a short period of time. I feel a responsibility to protect it and pass it on to the next owner, hoping he will feel the same. I've also developed a very protective feeling for the wildlife there, and will never knowingly do anything which might be injurious to any of it. I work hard at providing them a place, food and protection. I'm always very careful to take a minimum of game from the place, and have never taken a legal limit of any species. I enjoy seeing them running around the place too much to ever do serious damage to their populations. Being a good steward of the land and the wildlife on it makes me feel proud. Over a period of time approximately paralleling my ownership of the farm, my interest in black powder shooting and related activities has grown considerably. There's little doubt the two are interconnected. Having a place to do my thing has given me considerable incentive to do it. I can shoot all I please, whenever I please. I can wander the woods with a loaded gun when no game is in season, without risking the ire of the game warden, and I can dress like Rip van Winkle revitalized without risking being thrown in a rubber room. One of the most pleasant parts of owning the place has been getting to know it intimately at all times of the year, in all seasons, as they cycle. The lush, green woods of August, hot and humid, are familiar to me because I've spent hundreds of hours studying them while hunting bushytails with my flintlock rifle. Hot, dry, bright September, BP shotguns, darting doves. October, with its vivid fall colors, sitting for hundreds of hours on one deer stand or another, watching, always watching. November, cold, windy and frequently wet, the vegetation mostly gone, the fields brown, the squirrels busy laying in their winter larder. Cottontails, wading through the briar thickets with your legs on fire, the quick-draw when he bursts out, the satisfying sight of a tumbled bunny through a blue haze of black powder smoke. More of the same in windy, cold, maybe snowy December, plus early mornings and evenings on deer stand, watching the farm wake up, then shut down again. The first, beautifully fresh green of spring in March and April, fighting the wind while fly fishing for early bass on the pond. The glassy calm of the same pond in June and July, with bright blue sky and cottony white clouds reflected in a mirror surface, while tempting fat bluegills with a tiny fly on a #3 weight. In one corner of that pond is a favorite place for them to spawn, and hundreds of them have been taken there. It's exactly the spot I put my stool of decoys this December, on a chilly, rainy and windy afternoon, low dark clouds scudding by, while I hoped to ambush some mallards with my flintlock smoothbore. Same farm...same pond...different dimension. 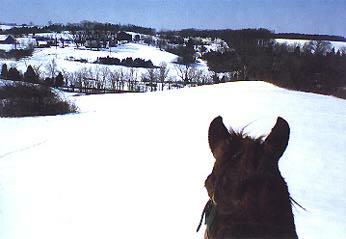 There are few places on the farm where I haven't sat and watched, or put my foot, or laid my head. Doing my trekking, I've spent many a marvelous time just roaming the place, soaking it in. I know the look of sunrise and sunset in all seasons, in every kind of weather. I've shot game of various sorts in many places, spent the night sleeping on the ground in many secluded nooks, studied the brilliant stars during many a long, comforting night. I've heard coyote puppies wrestling and growling nearby as I lay in my bedroll. The memory of reading John Locke by candlelight in such a camp is a pleasant one. Thousands of sandhill cranes have streamed by on many a winter day, evoking an emotion in me similar to that experienced when skeins of Canada geese send their wild cries down the wind. I've stepped over a newborn fawn while its mother blew at me from 20 yards in the brush. 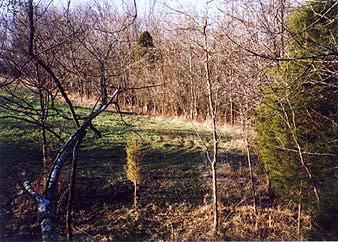 I killed my first whitetail here, with my Hawken rifle from another age. 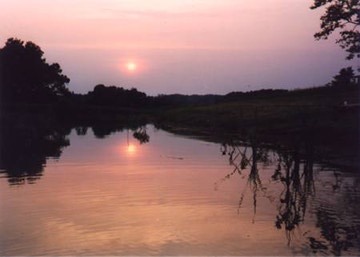 I remember well my first squirrel, rabbit, dove and quail taken here, the first mess of bluegills, the first big bass caught in my own pond. My farm has a 'tomahawk tree', which few do. Many a pound of Goex has been burnt, many a stump has served as a casual target. I started my first fire with flint and steel here, and now many a primitive meal has been cooked here over such a fire. The feel of the land through moccasin soles is one of my favorite sensations of the farm, as though it puts me in contact as nothing else can. Dressed in my version of the garb of a Kentucky settler of 1778, wandering about the place doing my primitive thing, I truly do feel transported, if not to that time, at least out of this one. That's a good thing. I've viewed the place from afoot, from flat on my back in the middle of the night, from horseback in all seasons, from high in several tree stands, over the sights of several muzzle loading guns, from the seat of a tractor and from my little fishing boat. Everywhere I look, it's beautiful to me, because of both the memories it triggers and the anticipation of what is yet to come. Watching and participating in the perpetual cycle of growth, withering and renewal, of birth, life and death through the small window into the natural world I've had on the farm, I have become more aware that I'm a part of that cycle. I find that very comforting, and feel at ease with the knowledge that my turn will come, that I will one day not too far away become the very soil of such a farm. The thought of having my ashes mingled with those of the many fires I've dreamed in front of on the farm brings a strange, lifting kind of joy. There are worse places to spend eternity. Sundown Farm. Not much of a farm, as such things go, but it has grown to be a part of me, and I of it. Nothing could be better for my peace of mind, which is what I hoped for from the beginning. I'm a person who not only values time spent alone, but needs it. The farm has provided that, in plentiful supply, and at the same time given me an education about the natural world which is unavailable from the finest university or the most well written book. It has also given me a view of myself, the inner man, which no psychiatrist could have provided.